Every hunter understands that investing in the Best Hunting Headlamp could help improve their experience through the convenience of hands-free illumination. Actually, hunting in a dark or dim environment could affect your returns, besides negatively affecting your attitude. So whether you feel there isn’t enough natural light coming into the woods or you find the night’s darkness underwhelming, hands-free illumination is definitely the right option for you. Unlike the hand-held flashlights, headlamps have become popular among outdoor enthusiasts as they help determine not only your level of comfort and safety, but also your level of success too. That said, here’s a detailed buyer’s guide that will see you settle for the Best Hunting Headlamp for your missions. An opportunity to get something resourceful and versatile from the different models of headlamps on the market. Why You Need A Hunting Headlamp. Headlamps Vs. Flashlights: Primary Advantages Of Headlamps. Convenience – Sizing And Weight. For most hunters, the best night hunting lights don’t always make the overall best hunting light. This means you need to take your priorities and hunting plans into consideration to find the ideal hunting lights. In reality, you’ll need hunting lights to find paths that animals use and to navigate through dark bends during the day and night. This is because finding animals paths during the day can be difficult due to the shadows cast about shrubs and trees. Hence, the right hunting headlamp helps you find even the most hard-to-find paths, besides coming in handy for blood tracking. During the night, hunting lights are helpful when it comes to finding paths, dressing the kills as well as reading maps. They are also used to preserve night vision and eye spot, and that’s where different lenses become useful. As much as flashlights (or lanterns) can definitely be useful, the main challenge is that they aren’t hand-free and packing them could be challenging depending on their size and shapes. It’s because of these and many other reasons that headlamps are considered to be more useful based on their portability, lightweight, suitability, and how easy you can strap them on your head. Other primary advantages include the impressive beam distance capable of casting long beams, making headlamps a big asset for finding poorly marked trails and other things in the dark. The hands-free design is also perfectly blended into a compact and lightweight construction to make it convenient for all hunting activities and easy to fit in any pack. Then there’s durability and water-resistance property, offering enough assurance for operating in rain storms (IPX-4) and underwater (IPX-7). A great option for areas with unpredictable weather. Irrespective of your experience, here are a few things to keep in mind when you go shopping for the Best Hunting Headlamp. Every hunter wants to make sure that the headlamp is comfortable and useful throughout their trips. Since you’ll strap it around your head for hours, ensure that the straps are of the correct sizing and fit. The headlamp together with its features should be easy to operate because most of them come with several buttons that are strategically positioned for convenience. About sizing, it’s recommended that you go for one that fits right, preferably something with more than what you need. As for weight, you’ll need to make sure the headlamp is light enough for your head to hold it without straining. The last thing any hunter wants to deal with a stiff neck. A good hunting headlamp model is one that offers better optics for both spot and close proximity modes. You must ensure that the headlamp has different lighting options, starting with white and red light to brightness adjustment options. In principle, the beam distance and pattern should be long and smoother for better illumination. You need to know if you want spot beam for locating trails or a spread-out beam for brighter spots. You could also go for headlamps with both options for maximum adaptability in every situation. Other things to take into consideration include the quality of light as well as the special signals. Most hunting (outdoor) headlamps feature Warm, Neutral, and Cool White LEDs, with a wide range of tint choices which you can choose based on your preferences. A headlamp’s design quality comprises of several things ranging from the interior build quality to the exterior design. In essence, a good design is meant to inspire durability, ease operation and increase the overall quality. Therefore, the material used should be strong and durable, waterproof or water-resistant to make it suitable for different environments, lightweight for easy mobility and convenience, and compact in size for handiness. Although the safety and comfort of a headlamp depend on its design, you need to take the operation life into considerations basing your interests on the material, ergonomics, and size and weight. A quality LED-headlamp should be made from strong material to protect it from cracks and scratches from vibrations, pushes, and falls. Besides, the material should be water resistant to improve hunting in rain and snow. A headlamp’s general safety and comfort greatly depend on the headband. The headbands size and weight should be comfortable and fit correctly to prevent it from slipping. One strap is designed to encircle your head and as the other is set across. Another big consideration for hunters is the battery quality and run-time. You need to choose a headlamp with the best battery quality depending on your hunting plans and situations. This means you have to settle for a headlamp with a long battery run-time, ideally for hours. Normally, Best Hunting Headlamps are designed to run on lithium batteries, which are a good choice for cold conditions since they outperform alkaline batteries in cold weather. As a result, rechargeable nickel batteries are also good as they work well in cold weather. Here’s where you need to bring your special interests into play. You can consider top straps, external battery packs, tilt (ability to adjust the light in a nice position), regulated output – ability to adjust the intensity of light, different lighting modes – red, green, white and blue lights, Auto-Adjusting beam, extra straps, water resistance as well as price (value). 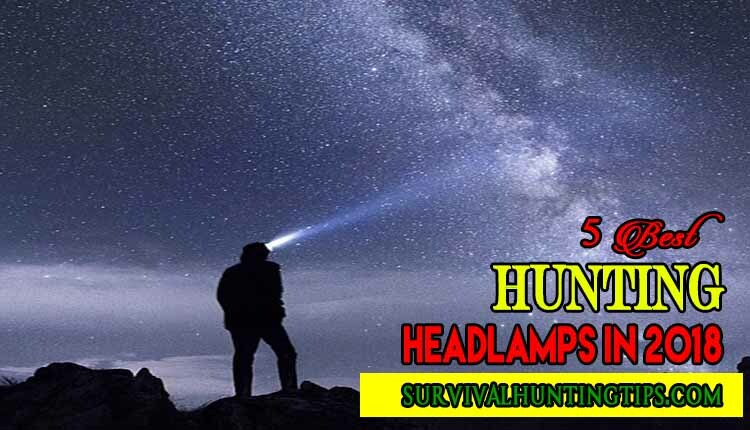 In view of these factors, here are some of my favourite hunting headlamps that could improve your experience out in the woods. This headlamp from Streamlight lives up to the manufacturer’s name. The Streamlight 61070 BuckMasters Trident is a versatile option that can suit any environment. It is a lightweight, water-resistant LED combination headlamp that allows users to multitask using both hands. For ultimate convenience and dependability, this multi-purpose headlamp offers you the versatility of three white 5mm LEDs, one green 5mm LED and a bright white C4 powered LED to light your paths through the woods and illuminate objects at different distances. Owing to its light output of 80 lumens, 4000-candela peak beam intensity, a beam distance of 126m and 5-hours run-time, the C4 powered LED white light is meant to suit lighting needs for close-up and distance work. The three green LEDs are meant to preserve night visions and offer long run-times, with 175-candela peak beam intensity, 26m beam distance, 20 lumens light output in addition to 20-hours runtime. While the single safety green LED serves to preserve night vision and lengthy run-times at 55-candela peak beam intensity, 15m beam distance, 6 lumens light output, plus 63 hours run time. As for operation and ease of use, this versatile Trident headlamp is equipped with a push-button switch that is recessed to protect it from accidental activation and easy to use when wearing gloves. Then there’s the low-battery indicator noticeable in the face cap and red LED flashes whenever battery voltage is low and the batteries are approaching their run time. For safety and convenience, it features a 90-degree tilting head on a robust ratcheting system to save you from neck fatigue. The straps are elastic and fully adjustable for correct fitting. Then the headlamp is powered by three AAA alkaline batteries that can run up to 150 hours. It is IPX-4 rated for water resistance with a bonus strong, co-moulded rubber construction at a 2m impact resistance. The C4 LED technology is extremely bright. 90-degree tilting head makes it convenient. Poor performance in extremely wet conditions. This outdoor headlamp from Luxolite is one of my favourite out there. Weighing just 3 ounces, this headlamp is the ideal deal for every outdoor activity including hunting. It really doesn’t matter what you’re using it for, because you’ll hardly feel its weight. It also features an elastic headband (strap) that stretches (easily adjustable) and fits comfortably so that you can achieve a perfect fit. The light is bright and strong, giving you enough illumination in all situations. You can adjust the brightness levels with red night vision LEDs or the main white LEDs. Whichever setting you choose, its features and battery life works well for reliability. At 168 lumens, the brightness setting suits different environments producing enough light as a typical 60-watt bulb. Depending on your terrain and needs for hunting purposes, the light is bright enough for an amazing experience. Moreover, this headlamp is also waterproof (IPX-6 rated), making it an ideal hunting light as it can withstand any weather condition. It uses AAA batteries which perform better in cold weather, making the lights an ideal addition to your outdoor gear. As for its operation and ease-of-use, it features two buttons for red and white light, and four cool white modes (SOS, MED, HI and LO flashing) and two red night-vision modes. Four cool-white modes and two red night visions for better illumination. Waterproof – IPX6 rated for adaptability in all environments. Some people have complained about the battery run-time. It takes a lot of time to recharge the battery. If you’re looking for smaller size headlamp, compact and lightweight, and won’t weigh you down, the Vitchelo V800 headlamp is an ideal option for you. Weighing at just 2 ounces, it is a lamp that you can barely notice on your head. The headbands are fully adjustable and made from breathable material for maximum comfort. The headlamp is powered by three AAA batteries, giving it a run-time of up to 120 hours. No matter the brightness levels you choose (even at full blast), the batteries have the power to take you through your entire hunting session. With a standard light output of up to 168 lumens, Vitchelo headlamp is super bright for all hunting activities in dim environments. In spite of the two light options (white and red), Vitchelo provides enough lighting but still lacks additional night vision modes. Convenience wise, it features 2 buttons for the red and white LED lights, making it a good choice for people who prefer the ease of use during operation. One button is used to control the spotlight which has 1 blinking setting and 3 settings to dim. While the other button is for the red light that is either full-on or blinking. Although it’s waterproof with an IPX-6 rating, it performs purely under adverse weather conditions with heavy downpour or snow. It can withstand splashing water and light downpour. Lightweight, at just 2 ounces. Comfortable straps made from breathable material. Long battery run-time of up to 120 hours. Poor performance in wet conditions. The shinning Buddy could be an ideal option for those who need headlamps for occasional use. Most users love how it combines the comfortable and reliable functionality for maximum convenience wherever it’s used. Fundamentally, this headlamp is only useful for specific uses since it has a light output of 160 lumens. Weighing in at 2.6 ounces, it’s an ideal headlamp for all family members starting from kids to adults. It presents a new era of diverse use of outdoor lights because of its four light modes. These four modes can be easily set/changed from the high-low to the red and red flashing modes. It also has a good mix of beams, making it a versatile option for most hunters. You really don’t need any excuse to leave your family behind when you go hunting or camping. Additionally, the headlamp uses three AAA batteries able to sustain the 160 lumens of light. Though it lasts long enough (12 hours) through the hunting session, the light is not bright enough to be used in extremely dark environments. The small size LEDs are designed to swivel to 45-degree to address the common bobbing problem in most headlamps. Compact and lightweight for use by kids. If you’ll be wearing your headlamp in the wilderness where you’re exposed to rough/dangerous treatments, build quality should be a big deal. The InnoGear 5000 Lumens headlamp is a highly powerful headlamp equipped with 4 working modes – flashing, high, middle and low. Its durable construction makes it ideal for all environments. Built with Aluminum Alloy, this headlamp is able to withstand rough treatments with the ability to resist mechanical damages. Besides, the design also gives it a strong impression that assures you of durability and dependability. This InnoGear headlamp has as strobe mode, 3 LED lights on the front and an additional safety light on the back. These options are perfectly combined into four lighting modes for you to choose from; 3 LED, 2 LED, 1 LED and Strobe. Technically, this is great for hunters, hikers, campers, cyclists, and fishers who sometimes may need light in all directions. At 5000 lumens, this headlamp is very bright to suit your lighting requirements. To control the level of brightness, you have 3 options to choose from: 3 LED’s, 2 LED’s, or 1 LED. This controls how much you need and the brightness that the headlamp offers. On top of its extreme brightness, this InnoGear headlamp comes with an elastic and adjustable strap for a comfortable and stable fit. It can rotate at 90-degrees to improve its convenience of hands-free illumination. In addition to the strong build quality, this headlamp is heatproof and waterproof to ensure adaptability in weather condition. Powered by two pieces of rechargeable batteries rated at 3.7V and 4400mAh, the headlamps can last up to 4-6 hours. Extreme brightness at 5000 lumens. Great performance in cold and hot weather. Its heavy compared to most headlamps. All things considered, when you go hunting or for any other outdoor activity, the last thing you want is to fumble around with gears or perhaps lose balance when managing your light source. Consequently, all the listed headlamps will serve you well based on your specific lighting requirements. From the list, the Luxolite Waterproof LED Head Light (Shop Now) happens to be my favourite hunting headlamp. I prefer this headlamp for its lightweight, brightness adjustable options as well as the reliable performance under all weather conditions. Though its brightness may be a concern for most hunters (and outdoor enthusiasts), its functionality beats most headlamps in its league. The most important thing when shopping for the Best Hunting Headlamps is to prioritize your interests depending on your hunting strategies and location. Theirs is always something that suits your interests as long as you use our buyer’s guide and keep priorities.